A team of Samford University researchers recently resolved a problem that has stymied pharmacists who treat pediatric patients suffering from pulmonary arterial hypertension (PAH). 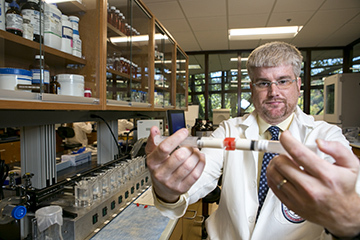 Led by Samford pharmacy professor John J. Arnold, the researchers sought to develop a compounded oral suspension of bosentan that would be appropriate for young patients. Bosentan, marketed as Tracleer, is a commonly used drug for patients of PAH, a progressive illness that in severe cases can result in failure of the heart muscle. In the United States, bosentan is available only in tablet form in strengths suitable for adult patients. For small—often newborn—patients, oral suspensions of bosentan can be prepared, but practitioners previously have not had stability data available in order to provide an appropriate beyond use date. “To our knowledge, no uniform preparation guidelines with validated beyond use dating for a compounded bosentan liquid preparation currently existed,” Arnold said. This meant that practitioners had no choice but to compound liquid preparations of bosentan with no validated beyond use date. Working with commercially available compounding supplies in a laboratory at Samford’s McWhorter School of Pharmacy, the team prepared a bosentan suspension and evaluated its stability under controlled room temperature as well as at refrigeration. They analyzed samples at nine time points during the 31-day trial period. In the end, the researchers found that the compounded bosentan oral suspension was “pharmaceutically elegant” with excellent suspendability. Whether stored at room temperature or refrigerated, the compounded suspensions maintained their physical stability and could be easily resuspended upon shaking at each sampling time, the researchers wrote in their conclusion. Also, neither the odor nor the color of the compounded suspension changed throughout the period of study, which suggested a lack of bacterial growth, they noted. The idea to tackle the problem in the laboratory came from one of Arnold’s Samford pharmacy students who was doing a clinical rotation at Children’s of Alabama hospital in Birmingham in 2014. “They were having to prepare the compounded preparation each day, which was wasteful and time consuming,” Arnold said. When the student, Alina Malik, suggested that she study the stability of compounded bosentan for her senior research project, he readily agreed. In addition to Arnold, who directed the research, the Samford research team included faculty member Gregory Gorman and staff member Lori Coward. Malik, who graduated with a doctor of pharmacy degree in 2015, is now a pharmacist at a Walgreens store in Fort Worth, Texas. The results appeared in an article in the May 2016 issue of Hospital Pharmacy, an independent, peer-reviewed journal widely read by hospital and health system leadership and staff. “Apparently, a lot of other pharmacists had been looking for a recipe because I have received quite a bit of correspondence about it,” said Arnold, who has responded to inquiries from across the United States and other countries. Some writers wanted to make sure they were preparing it the right way, Arnold said. Others had more specific requests. A hospital pharmacist in Chile wrote pleading for Arnold’s help after she discovered the abstract online but could not access the complete article. She needed the information, she wrote, to prepare a stable and safe suspension for a critically ill newborn that was under her care. “I provided her a copy of our paper and answered her questions about the preparation. Hopefully, it helped, and that little one received the medicine needed,” Arnold said.